Looking for soft comfortable carpet that is also durable and easy to clean? STAINMASTER® TruSoft® carpet is one of the top rated soft carpets available. It feels great on your bare feet as you walk around your home. TruSoft® carpet is manufactured from specially engineered nylon fibers to give it a super soft feel. It’s soft and shows color beautifully but is also known for its durability. This little fiber is resilient, repellent, long-lasting and easy to clean. Coventry Carpets is a STAINMASTER® SHOWCASE dealer, one of two dealers in the state of Colorado to have this distinction. Give us a call to schedule a free in home estimate! Here is a review that one of our clients just posted on Google. Click on our reviews page to see why we have a 5 star rating from our current 99 reviews. These guys are awesome! They came to my house and brought me samples after I explained to them what I was looking for in carpet. No need to run around all over town in this horrid Denver traffic. Everything went smoothly from the selection process to final install. I would definitely recommend them! 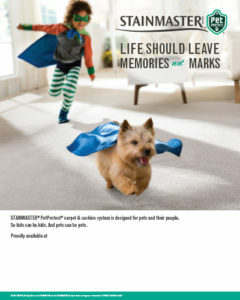 Stainmaster®’s PetProtect® is the best carpet if you have pets. Pets can do a number on your carpeting, especially young pets. Pets shed hair and have accidents which will reduce the life of your carpeting. Stainmaster® the leaders in carpet stain protection have developed PetProtect® Nylon Carpeting that is designed to prevent carpet stains with stain-resistant nylon. Spills should not become permanent stains if the spill is treated right away. STAINMASTER® carpet is famous for being easy to clean, and rightly so! Our proprietary technologies, including LotusFX® Fiber Shield, allow STAINMASTER® carpet to deliver excellent stain and soil protection.